This weekend saw the fortieth anniversary of New York's Stonewall riots, marking the birth of the gay rights movement. Tired of being victimised by police, the clientele of mafia-run Greenwich Village gay bar the Stonewall Inn, fought back when cops attempted to raid the venue. For five nights from 28th June 1969, drag queens and gay men battled police, inspiring a defiantly upfront gay and lesbian rights movement in the West in contrast to the previously low-key, almost apologetic approach to gaining equality which had been seen up until then. In Britain that prompted the birth of the Gay Liberation Front (GLF), fomented in a revolutionary atmosphere of anti-Vietnam war camapigning, the Black civil rights movement and feminism. To mark the anniversary, LGBT history group Brighton Ourstory Project organised an exhibition and talk at Hove Library. Linda Pointing from Ourstory introduced a sequence from "Over the Rainbow", a long-forgotten documentary shown on Channel 4 in 1995, featuring powerful and frequently funny contributions from people involved in the riots or in radical gay politics in the US at the time. Inspired by the news coming from America and the rapid formation of the GLF in London in response, a group of Sussex University students set up the Brighton GLF, its highlights being a march on the sea front and a 400-strong ball in the Albion Hotel. One of the founders gave a sometimes illuminating, if a bit rambling, talk about those early days, and Linda read a couple of short extracts. 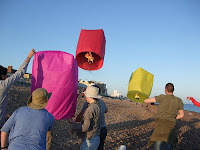 After the talk a group of us trolled down to the beach to set off some giant paper sky lanterns to symbolise the 80+ countries where being gay or lesbian is still illegal. they were meant to be set off at the International Day Against Homophobia but the weather had been too awful, so we had a fitting end to the event as we set off sky lanterns into the sunny evening sky (see Lilac Bonzai's Flickr photo stream to get an idea of it). Naturally people (ok, mainly children) wanted to know what we were doing and my attempt to explain to a five-year old only received a blank look, so much respect to his mum who told him "When a mummy wants to love a mummy and a daddy wants to love a daddy, in some countries they're not allowed to." Job done! "This one's about inviting your relatives round for a meal... except they leave without eating anything - because they're dead." That tongue-in-cheek eeriness epitomises Spacedog's darkly humourous take on electronic music. The Angliss sisters - Sarah on theremin, musical saw, laptop and assorted home-made instruments, and Jenny on haunting ethereal vocals - channel the spirit of classic British horror films like The Wicker Man into a fascinating set of songs by Brel, Weill and traditional children's rhymes with an inevitably creepy edge, supported by an array of other-worldly instuments. A tribute to the original Spacedog, Laika, is accompanied by robotic bells, while automaton doll Clara twitches and flicks an ace of spades card during a particularly haunting song about a dead child, punctuated by excerpts from a 60s public information film about the dangers of playing near water. The second part of the show featured a live demonstration of an original 1910 Edison phonograph, playing from a wax cylinder and recording voices from the audience onto another, unnervingly sounding just as if it had been recorded a century ago. 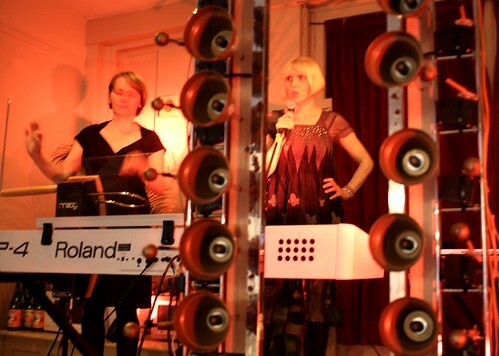 Both fascinating and funny, Spacedog are one of the most inventive acts playing at the moment, and the audience at Eat@ in Hastings were left beguiled by this spooky and engaging performance.